Elite Motor Sports aims to be your go-to resource for auto accessories, repairs and servicing in Woodland. Providing you with everything from tires and wheels to lift kits and services like powdercoating, Elite Motor Sports is proud to serve you with the best auto accessories and servicing in Woodland. Contact us today to learn more! In our previous blogs, we’ve looked at some of the benefits of our products and services. From looking at reasons as to why you should lift your vehicle, to the benefits of getting your wheels aligned, Elite Motor Sports aims to be your go-to auto accessory and service shop in Woodland. In this blog post, we’ll take a look at a few reasons as to why you should consider lowering your vehicle. From aesthetics to functional benefits, lowering your vehicle can provide you with a variety of different benefits. 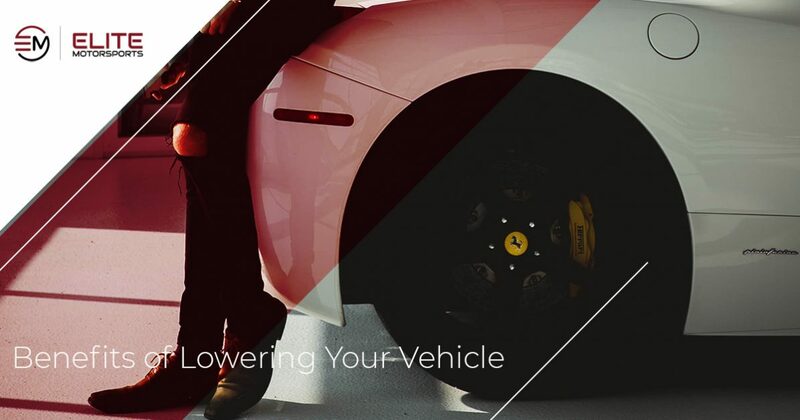 Read on to learn more about why you should lower your vehicle! While this is more true of some vehicles than others, the center of gravity is one factor that contributes to the overall stability of your drive. When you lower your car’s suspension, you are making it sit closer to the ground, which in turn can increase its stability. If you had reservations about your car’s stability in the past and were hoping to find a way to increase this, lowering your car can help with this. Increasing your car’s stability by lowering its suspension can also help decrease your chances of a rollover. In addition to increasing your car’s stability, investing in a lowering kit for your vehicle can also effectively make for more comfortable and easy handling. Bringing the vehicle closer to the ground can improve your tires’ overall traction, making for better handling and a better drive overall. This may not be entirely true for all vehicles, however, so if it’s increased handling that you’re looking for, contact a professional at Elite Motor Sports to help you determine which method is best for your particular vehicle. While lowering your vehicle comes with a variety of different functional benefits, at the end of the day, many people choose to lower their vehicles for the simple reason that it looks great. Whether you’ve got the car of your dreams and are looking to give it an added element of style, sportiness and class, or you’re looking to upgrade your current ride with some features to make it a bit more pleasing to the eye, lowering your vehicle is a great way to make your vehicle look great. Whether you’re looking to draw on the style of classic lowriders, lower your truck to give it that extra bit of flair or lower your daily driver to breathe some new life into it, lowering your vehicle certainly adds a considerable amount of visual appeal to it. In the instance that you choose to sell your car at some point in time, it could be the fact that it is lowered that results in someone making the purchase. Those are just a few examples of why you should lower your vehicle. Whether you’re new to the world of lowered cars or you’ve been thinking about doing it for a while, Elite Motor Sports aims to be your go-to auto accessory store for lowering kits in Woodland. Whether you’re looking to lower your vehicle, replace your wheels and tires, or go in the opposite direction and lift your vehicle, Elite Motor Sports aims to be your top resource for car accessories, services and repairs in Woodland. Contact Elite Motor Sports today to learn more, or visit our shop in Woodland today!